Editha lost her husband in a massacre that killed 56 others in Maguindanao last year. While afraid for the safety of her family, she hopes for justice. 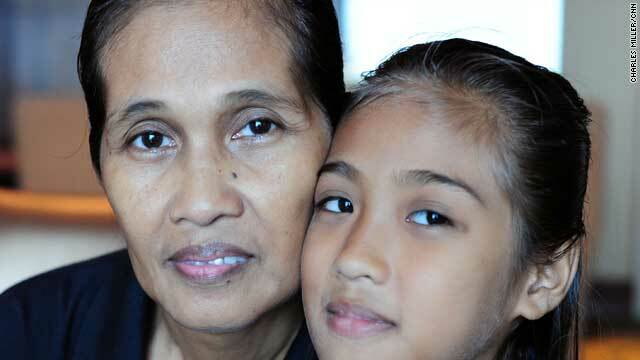 Manila, Philippines (CNN) -- I didn't need to understand a word of what Editha was saying to feel her anguish. Her voice was thick and guttural, the sound of a woman utterly exhausted by sorrow and pain. I look over to her 10-year-old daughter Herminia who surprisingly breaks out into a massive smile, as if the conversation wasn't about how her daddy died. Herminia's father, Daniel, had taken on a second job with UNTV, a local network, to make extra money to support the family. Last November 23 he was in the lead vehicle in a convoy carrying Esmael "Toto" Mangudadatu's wife, two sisters and other women on their way to file election papers for governor. Mangudadatu was daring to challenge the powerful Ampatuan clan that governs the province of Maguindanao with guns and intimidation -- and with support from the government in Manila. He thought it would be safer to send women, but he was wrong. The convoy was ambushed, everyone in it slaughtered, including Mangudadatu's wife, two sisters, other women and at least 30 journalists. Fifty-seven bodies were recovered, some shot assassination-style, others when their vehicles were sprayed with bullets and then crushed. Daniel was in the lead vehicle. "It's very painful, I couldn't accept what had happened to him because when I saw them pulling out the van that he was in, it was flattened," Editha said slowly. "It looked like a crushed can of Coke. And he was there in the car. I didn't know how to tell my children that their daddy was there." She said the kids initially refused to believe their father was in the convoy. They were convinced that he had escaped or survived. "It wasn't until I brought home his remains that they believed that it had happened," she said. As we sat looking at old family photos, Herminia peered over. She said nothing, but each time we made eye contact she smiled, catching me off guard. I smile back each time, remembering her mother saying Herminia was the most affected among the three children by their father's death. We met at my hotel. Editha doesn't allow the media to film her at her house. If they do something to me, I have three children who will be left behind," she said. "Who will look after them?" Even though the government has thrown 200 people behind bars -- most of them members of the Ampatuan clan -- their reach and ability to instill paralyzing fear is not impaired. Clan members -- among them some who are currently detained but not yet convicted -- are still running for government posts in the upcoming elections. And even though the senior members are being held at a "maximum security facility," Andal Ampatuan Jr. held a press conference declaring his innocence and endorsing one of the candidates for president. For decades the Ampatuans ruthlessly ruled Maguindanao. Under President Gloria Arroyo they cemented their grip on power and expanded their private militias, armed by the government to help counter a growing Islamist insurgency. The family patriarch is the governor; his son the mayor. Cousins, relatives, loyalists all hold positions of power. Following a nationwide outcry after the massacre, authorities said they were looking into how these so-called "force extenders" turned into partisan armed groups. The government cut all ties with its former allies, Arroyo declared martial law in the area, the Ampatuans' weapons were confiscated -- many of them government issued. The government is now trying to rein in the different private militias in the country, but it's not going so far as to ban them. Arroyo's spokesman said the government's relationship to the Ampatuans ought not to be judged in terms of what happened in prior years, but in terms of how the government responded when there was an actual crime committed by the family. But the looming question still is: Will the Ampatuans really face justice? Harry Roque, who represents Editha and some of the other families of the victims, said that the biggest challenges are overcoming the weak judicial system, with its conviction rate of only 18 percent, and the state itself, which he doesn't trust to prosecute the Ampatuans. "We have in fact legitimized state terrorism in the sense that all 197 accused in the case are all state organs," Roque explains. As voters head to the polls, many hope a new government will break what has become a pattern of alliances with forces all too willing to use violence to maintain their grip on power. Editha is afraid of retaliation, but her desire for justice is stronger. "We need to fight for this," she said, fighting tears. "If we don't do anything, this case will be forgotten with all the problems this country faces."